The unemployment rate for Americans with college degrees dropped this May, movement that could be the lone bright spot in an otherwise bleak jobs outlook, MSNBC reports. Americans with a college degree are now more than twice as likely to find work than Americans with just a high school diploma, according to figures from the Bureau of Labor Statistics. The unemployment rate for college graduates has registered a decrease even as unemployments levels for other cohorts have increased slightly. These numbers buttress the traditional intuition that getting more education raises one’s chances of finding work, especially in a troubled economy where low-skilled labor is often outsourced abroad. The figures also fuel a national debate over whether a college degree is worth the years of debt it incurs. A college degree signals to employers that a worker is willing and able to learn, Jack Downing, a managing partner with the job placement firm MRINetwork WorldBridge Partners, tells MSNBC. Specifically, the unemployment rate for college graduates dropped to 3.9 percent from 4.0 percent over the past month. For those with a high school degree only, the unemployment rate increased from 7.9 percent to 8.1 percent. The overall unemployment rate is now at 13.0 percent, up slightly since April. Yet benefits to a college degree are mirrored by the rising cost of college, which reaches $60,000 per year at some elite universities. 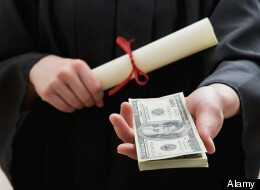 About 75 percent of Americans think college tuition is too expensive for most people to afford, a 2011 Pew study found.